Today Fashion Hunt World has brought Traditional Menswear Kurta's for Eid Occasion, Which is recently launched by Eden Robe. Eden Robe is well known manufacturer and retailer of Ready Made outfits in Pakistan. They are so renowned for its menswear formal and semi formal collections. You can find in this collection exclusive range of cotton kurta's which are nourished with simple embroideries. On Eid day every men wear simple kurta's. Eden Robe introduced prominent colors are white, brown, grey, black, blue, red, and sea green. 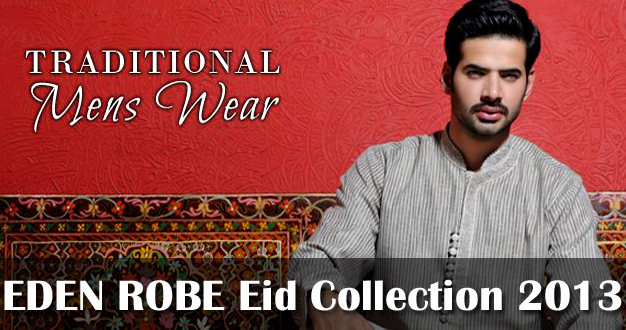 These kurta's makes your Eid day luxury and comfortable. The designs of these Eid wear kurta's are quite simple and plan but matching embroidery work done over kurta, sleeves and neckline. Nice Collections! Partywear Kurta Pyjama is a favorite among grooms when it comes to wedding ceremonies.The kurta pyjama can range from simple whites for traditional home events to highly decorated sets suitable for lavish Indian weddings. Thanks for Sharing this wonderful blog with us.